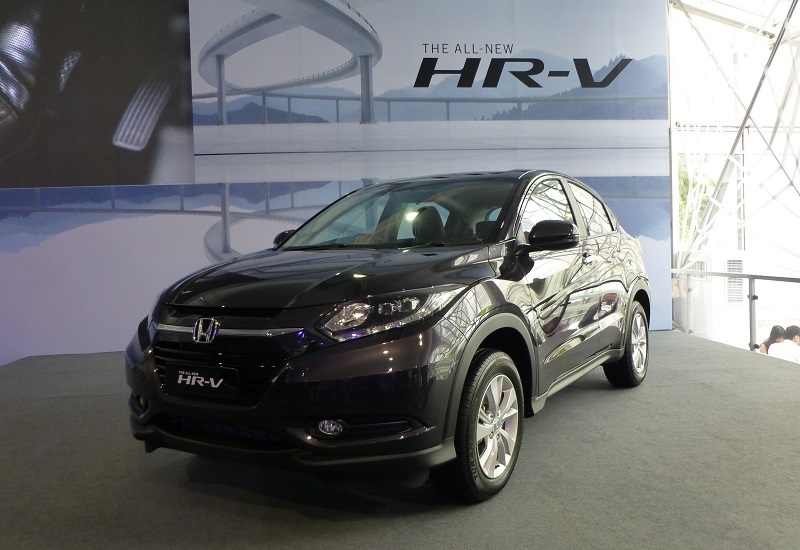 The Honda HR-V, which is making its debut around Asia, is a brand new model in Honda's line-up. It is a small, compact sized SUV and looks set to become a most significant model in Honda's future. As the HR-V is a brand new model, perhaps even seasoned Honda enthusiasts may not be fully appreciative of its uniqueness and design objectives. In this article, we give you a technical overview of the HR-V, using materials from the product overview presentation given by Honda at its launch a few months ago. Bear this in mind when reading this article as there will be lots of catch-phrases and keywords used here, being taken from the presentation itself. At the end of this article, we hope that you will get a new appreciation for the Honda HR-V and what makes it unique. Please take a moment to read through our 'disclaimer' before proceeding to the article below. The HR-V is Honda's "New generation crossover compact SUV offering". There are two key points Honda engineers used in its conceptualization : "compact but with strong presence" and "personal and with good utility". These points drives the actual design concept of the HR-V. They are derived from results of research by Honda on their customers 'desires', what they want, from a new model in the compact vehicle class. Honda categorized these 'desires' into 3 categories, each from which Honda derived actual physical properties related to the real-world. a solid looking design with a strong "presence" which gives a feeling of "superiority"
To meet these 'desires', it was decided that they are best met with an SUV design. The premise of the HR-V is for their "customer that (who) live their life to its fullest"
These two values merges into 'High level, Fusion, and Compact' concept. Exterior-wise, the HR-V is a 'multi-dimensional' crossover design which combine the attractiveness of a stylish car and the toughness of an SUV. Honda calls this a crossover of 'coupe emotion' and '(SUV-type) tough function'. 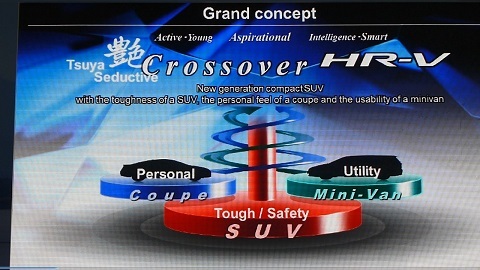 The exterior design concept is called 'dynamic cross solid' and comprises a "powerful" (distinctive looking) nose (front end), (a) coupe-like aero-cabin, and a strong lower body with "good stance". In the front, there are two crossing solid lines which creats a dynamic, distinctive and sharp outline starting from the C-pillar. The bold and wide front end represents strength and the multidimensional lower area represents toughness. In the rear, the sharply figured aero-cabin and wide lower body establish a strong stance. The front (nose) contains a "unified grille" and lights representing a cutting edge design and which give a feeling of strength which Honda calls the 'solid Wing face', derived from the concept of 'Exciting H design' which Honda has used in the FMC for the Jazz and City. The black grille colour demonstrates toughness and durability. The concept for the interior is an "Expansive Cockpit", which is exemplified by the keywords young - active - aspirational - sophisticated - smart. In this context, expanse(ive) means 'roomy' so the interior is designed to be big and roomy for the occupants. But Honda also put in a "tight and sporty image cockpit" into the interior design. These two conflicting values "cross each other" (are combined) with the keyword 'Adeyaka' which is another concept of 'Exciting H Design'. The 'official' translation for the japanese word 'Adeyaka' is given as 'fascinating' and 'fascinatingly elegant'. In this context, Adeyaka means the interior is not seen as a cabin but more of a 'cockpit', like that of an airplane. The intention is to move away from seeing the interior cabin as simply a place to sit in but as a 'cockpit' which is visual interesting but is functional as well. The large diameter tyres gives a 'High Eye point' (of view) and high road clearance. The driver sits high and his gives him or her a good vantage point of the road in front. This and high road (ground) clearance are the traditional advantages of an SUV. For the boot/trunk area, a low floor offers larger (higher clearance) cargo space. The tailgate is wide and the tailgate sill is low which allows easy loading and unloading of bulky goods, the mountain bike being the standard reference here, like for the CR-V.
On the dash, the instrument panel features "black faced instruments" (speedo, tacho, and other dials with black background). The speedo is completed with a floating illuminating ring which changes colour based on instantaneous fuel consumption (optimal FE makes the ring turn green in colour). For Malaysia, the HR-V adds a new vehicle colour, called Ruse Black metallic in addition to the standard colour palette shared with the other models in the local line-up. The interior only comes in black. Now we look at the real 'hard metal' stuff, the actual vehicle itself. Having gone so much of concepts, ideas and implementation, when looking at the actual vehicle, bear in mind that the HR-V is a compact-sized 'B-segment' vehicle so its external dimensions are along the lines of the 'compact' class. In terms of the crucial LWH dimensions, the HR-V is 4294mm long by 1772mm wide with a vehicle height of 1605mm. This compares to the LWH 4440mm X 1695mm X 1477mm respectively for the Honda City, on which it is based. The two shares a common platform, so the physical difference are due more to the difference in design - the City is longer because it comes with a boot (trunk) while the HR-V is a taller vehicle due to its SUV design plus a higher ground clearance. The slight, 5%, difference in width is most likely due to measurement points - the width of a vehicle being that of the widest part which is almost always between the outer edges of the two side mirrors and the side mirrors are different. The kerbweight is between 1239 to 1249kg, compared to 1075-1106kg for the City, significantly heavier. Wheelbase is 2610, just a big longer than that of the City (2600mm). The HR-V rides on 215/60 R 16 wheels the tyres being higher profile than the City's. Like the City and Jazz, the HR-V features a center fuel tank layout. This plus the torsion beam rear suspenson 'realize the amazing rear space with compact and coupe-like exterior'. Knee room for the rear passenger is said to be as spacious as the 'one class higher' SUV (i.e. the CR-V). The HR-V offers 'optimal visibility for driving and ease of entry and exit'. The so-called 'high eye point' (100mm higher compared to typical sedan/wagon) improve 'ease of driving' by allowing the driver to see further ahead up the road, allowing him or her to make anticipatory moves to cater for traffic conditions. The front passenger's hip point is high, which reduces the hip movement when getting in and out of the car, improving ease of entry and exit. The HR-V features an electric parking brake system, i.e. the parking brake button replaces the traditional lever. The center console offers a combination of both personal space and usebility 'at a high level' - the console box on the center console comes with an armrest while the console pocket (inside the box) contains the USB port, HDMI and accessory socket. The design objective for the HR-V's rear cabin was to 'Create space that provides a relaxing environment for occupants with useablity equivalent to one class higher SUV (again the CR-V)'. For the rear seats, an 'ample size stitched armrest' is provided while there is sufficient 'tandem distance' to provide a relaxed space 'beyond its class'. 'Tandem distance' here equals knee room for the rear passenger. For the cargo area, i.e. the boot/trunk, it is furnished with simple but high quality finished trimmings and is spacious due to a specially designed 'user friendly' square floor. The rear cargo entry, i.e. the tailgate opens up/out to provide an access area of 900mm by 1180mm (H X W). The floor or sill height is only 650mm from the ground. This allows for very easy loading and unloading of large bulky goods, something a 'handyman' or DIY type Honda enthusiast will definitely relate to and appreciate. Unlike the City and like the Jazz, the HR-V comes with Honda's famous 'Magic Seats' which offers 'multi-utility' cargo room. The configurations available are simplified however, into either a 'Tip-up' mode which is functionally equivalent to the 'tall mode' and a 'Dive-down' mode, using either one or both side of the rear seat rests and this is functionally equal to the 'Wide mode'. Long time Honda fans will be in familiar territory here. There is no 'long mode' equivalent - the front passenger seat does not fold down backwards completely flat, like in some generations of the Jazz. Now we touch on the mechanicals of the HR-V. First the powertrain. 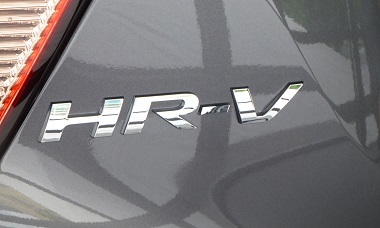 The HR-V engine is the R18A, adopted from the unit used on the 1.8 Civic. This engine features a 'high-dimensional balance' of fuel efficiency and power by (using) the SOHC VTEC mechanism. Key features of the R18A which targets the FE and EM (Emission) aspects are the SOHC VTEC mechanism which offers an economy-power cam operations configuration for VTEC-off/VTEC-on operations, a 'high-performance' air-flow sensor, and a 'high-rotation' high torque starter. (Though to be honest, I do not see how the starter can contribute to either FE or EM benefits. The R18A features weight reduction with a 'light-weight' camshaft and power output is maximized without sacrifice to emissions by the use of a low back-pressure 'closed-coupled' catalyzer (catalytic converter). It features MoS2 (Molydebnum Disulfide) pattern coated (i.e. the coating is in a pattern, usually pokka-dot) pistons, the MoS2 reduces friction between the piston and the cylinder walls and the patterned coating allowing better retention of engine oil on the piston walls. Specs-wise, the R18A delivers a max power of 105kw/142ps at 6,500rpm and a max torque of 172Nm at 4,300rpm. Note that these figures are slightly different from that of the 1.8 Civic. The R18A was slightly reconfigured to better suit its use with the HR-V. Redline is the same with the 1.8 Civic, at 6,800rpm. The HR-V uses a 'newly developed' CVT for small size class models. Key advantages of this CVT box are FE improvement from reduced (internal) friction, weight reduction from a 'rationalized' (improved internal layout) design, and 'Driving Feel' improvement from a new 'G design shift' control - programming of the operation of the variable gearing to avoid the standard 'rubber band' feeling of a CVT gearbox and to improve throttle response. The CVT offers different programming for kick down characteristics - a faster 'G rise' (i.e. feeding more of the engine torque/power to the front wheels faster upon WOT, and also to maintain an optimal gear ratio longer and a high gear ratio, again to optimize throttle response. The HR-V uses MacPherson struts for the front and a 'H-shaped' torsion beam for the rear. The steering is an EPS, using a brushless electric motor and is motion adaptive, meaning that assist is variable according to vehicle speed. Assist is more at low speeds and less at high speeds, giving a more consistent steering 'weight'. Honda says the HR-V offers "United steering linear feeling and invigorating feeling", which realizes fun driving by lowering the center of gravity of the vehicle. The roll behaviour of the HR-V is 'unified' (made more consistent) with steering operation (i.e. when the vehicle is turning), by lowering the front part of the vehicle. This means the amount of roll on hard-cornering in the HR-V is controlled and not excessive till it becomes detrimental to the stability of the car. According to Honda, in combination, the frontal (surface) area and CoD (i.e. coefficient of drag) of the HR-V is lower than typical SUVs. This reduction in wind resistance helps with fuel economy. In addition, the underside of the HR-V is covered, with an Undercarriage cover which helps smoothen the airflow under the car. This helps with car stability and further reduces wind resistance at high speed. NVH in the HR-V has been improved by using an "efficient configuration of acoustic insulation", i.e. use of acoustic padding to minimize road and wind noise while driving. The "acoustic insulation package" used in the HR-V comprises sound absorption (padding material) in the rear inner fender as well as a special sound absorbing floor carpet. The design objective was to tune the NVH during cruising, and the HR-V's ratio of 'flat road noise'(i.e. good condition road surface) to 'rough road noise' (i.e. bad condition road surface) is on a par with standard SUV with slight above average absorption of 'flat road noise' (i.e. quieter on good road conditions). It is also slightly quieter on both types of road surfaces than the typical compact sedan. Based on Honda's own in-House testings, the HR-V acheives an ASEAN-NCAP 5 star rating. In terms of 'Real world safety', the HR-V is equipped with both GCON and ACE Body Structure which offers comprehensive protection for front offset, Front flat (collision), (and for) child (protection in a collision), side (impact), whiplash (for rear-ended impact), pedestraint (-safety of the pedestraint in the event of a vehicle to pedestraint impact), head and leg impact (protection), rear, and upper interior head protection. For "Active Safety", meaning features and characteristics of the HR-V which "switches on" to enhance safety, the HR-V is equipped with a very comprehensive set comprising VSA (Vehicle Stability Assist), HSA (Hill Start Assist), ESS (emergency stop signal), DRL (Daylight Driving Lights), and including of course ABS with EBD and dual-SRS. "Passive safety" comprises Pretensioner ELR seat belts with load limiter (to prevent injuries caused by the seat belt itself), ISO fix (for child seats), and Side and Side curtain airbags (the side curtain airbags drops to protect against glass splinters in the event of a side collision). As with all recent Honda's new models, the HR-V comes extremely well equipped with accessories and features. The dashboard is designed along the concept of a "Smart Touch Interior: (which) Supports smart driving to everyone". For Malaysia, the audio display is either a 5" or 7" display depending on model grade. The top Grade-V variant comes with the 7" display which has an electrostatic touch panel for touch-screen operations. Integrated hands-free telephony is provided for smartphones via Bluetooth and iPhone owners can also use Siri. The main instrument cluster offers the by-now standard vehicle information display as well as 7 colours for adjusting ambience. The automatic air-conditioning control panel also comes with a touch screen control panel. The air-conditioning system offers a "Wide-flow system" for the (front) passenger side which features one big wide vent on front passenger dash with adjustments for side-to-side and up-and-down. The HR-V does away with the traditional parking brake lever and comes with an Electric Parking Brake system. This is activated by a switch and released via the accelerator pedal. So the parking brake is activated by pressing the E-park switch on the center console. Then, with the additional safety feature that the driver must already have his seat belt fastened, the parking brake is automatically released when the accelerator pedal is pressed. This is complemented by the new "Automatic Brake Hold system" or ABH. A 'BRAKE HOLD' indicator comes on to indicate ABH is ready and on standby. In operation, when the brake pedal is pressed and the vehicle stops, it is automatically held in braking position (i.e. brake is applied) even after the brake pedal is released. Again, ABH is automatically released when the accelerator is pressed (driver seat belt must also be fastened). If ABH has been activated after a "long time" (exact time was not given though), the EPB above is then automatically activated.